Good soil fertility management for pasture land supports animal health and protects water quality. Healthy pastures with a dense sod cover can help to achieve better animal performance, reduce the need to purchase feed, and decrease nutrient runoff and soil erosion. Well managed pastures also provide aesthetically pleasing open space for the viewing public to enjoy. While soil fertility and nutrient management are the major subject areas to be discussed in this fact sheet, they are only two components of the overall pasture management system that should include the establishment of fencing and paddocks, rotational grazing, timely mowing of mature grasses and weeds, using an optimal animal stocking density, proper forage species selection, and pasture renovation. A recent survey of horse pastures in New Jersey has unfortunately shown that soil fertility of these lands is often poorly managed due to either excessive stocking density or neglect. When the recommended equine stocking density of 1.5 to 2 acres per mature animal is exceeded, pasture quality declines, and this can lead to excessive accumulation of phosphorus (P) in the soil. The majority of horse pastures (72%) were found to have soil test P levels above-optimum, which is considered excessive and a concern to water quality. Only about 15% of pastures had low soil test P levels and needed additional P. In the case of potassium (K), 36% of horse pastures tested above-optimum for K, and about 19% of horse pastures needed more K. About a third of horse pastures were found to have soil pH levels well below the recommended pH range of 6.0 to 6.5, suggesting that good liming practices are being neglected on some pastures. A common problem with managing nutrients on horse pastures is the build up of excess levels of nutrients in the soil. An excessive buildup of P in soil is the most common problem and is of particular concern for its potential impact on water quality. Buildup of nutrients is a consequence of several factors that are related to the nature of the equine industry: 1) pastures are often overstocked because of their use as exercise lots in addition to their use as a feed source, 2) unlike other livestock farms that produce and export meat or milk, horse farms export very little product, 3) most nutrients consumed by grazing horses are recycled back to the pasture as manure, 4) in addition to pasture, most horse farms feed hay, grain, and mineral supplements and use bedding that are imported onto the farm resulting in excess manure nutrients deposited on pasture soils, and 5) horses are typically selective grazers, and they poorly redistribute manure nutrients over the pasture. Sometimes the routine application of common (those containing nitrogen (N), P, and K) fertilizers to pastures without following a soil test recommendation is a cause of nutrient build-up. Soil samples should be taken from horse pastures, every 2 to 3 years to monitor soil nutrient status. Soil testing not only serves to guide nutrient applications to pastures, but also serves as the basis for developing a farm nutrient management plan. It is a very useful practice to keep records of soil test reports over a period of years to document whether nutrient management plans are succeeding in keeping soil nutrient levels in the optimum range and in balance. If, for example, it is documented from tracking soil test levels over time that soil test P levels are continuing to climb into the above-optimum range, this indicates that there is a need to adjust the nutrient management plan. Corrective actions may include: 1) reducing the pasture stocking density, 2) collecting horse manure from the pasture and exporting it to a farm that can utilize the nutrients, 3) composting the manure and selling the compost product, 4) adjusting the mineral supplement to feed the minimal amount of P required for health of the horses, 5) setting up a rotational grazing system to improve pasture recovery and ensure better manure distribution, and/or 6) producing hay for sale on some of the pasture land to draw down soil P levels by crop removal. However, if it is documented from tracking soil test levels over time that soil test P levels are falling into the below-optimum range, then P fertilizer application or additional manure can be recommended. This second scenario, however, is not common because it takes years or perhaps decades of crop removal to draw soil P down from an above-optimum level to the below-optimum range. Manure deposition by horses on pasture is a major part of the nutrient cycle. Estimates on nutrients recycled in urine and feces from forages consumed by horses are 85% of the P and 98% of the K. Thus, it is apparent that rates of nutrient removal from soil by grazing horses are rather low. Furthermore, on a typical horse farm, some imported hay, grain, and mineral supplements are being fed in the barn. When the resulting manure is distributed on pasture, either by the horses or spread on the land by the equine operator, it has the net effect of nutrient accumulation in soil. An effective nutrient management plan should place a large emphasis on the best utilization of manure nutrients in preference to purchased commercial fertilizer, because horse farms over the long term have a tendency to accumulate nutrients, especially P. Once soil P fertility levels in pastures are allowed to rise into the excessive range, it may preclude manure application and make it necessary to find alternative outlets for the manure that horses continue to generate. Thus, before any commercial fertilizer is purchased, especially P fertilizer, the equine operator should carefully assess the total nutrient resources already available on the farm by way of a nutrient management plan. The first step in nutrient management planning is to begin with soil sampling and testing of each pasture or field on the farm. If the soil test report indicates a nutrient deficiency or a need for fertilizer application, a plan should be developed to effectively utilize any stockpiled horse manure or composted horse manure in place of purchased fertilizer. Average daily production of manure is about 51 lbs per 1000 lbs of horse (31 lbs feces and 2.4 gallon of urine). Horse manure has a typical nutrient composition of 28 lbs of N, 14 lbs phosphorus as P2O5, and 24 lbs of potassium as K2O per ton of manure. Other nutrients are also present that can contribute to soil fertility and plant nutrition. In addition to feces and urine, about 8 to 15 lbs of spoiled bedding is produced per horse per day. Because nutrient content of manure is influenced by type of feed and the bedding material, it is important to sample the manure and have it analyzed by a laboratory. Rutgers Cooperative Extension Bulletin E306 provides information on how to conduct a manure analysis. On soils that can make good agronomic use of N and P from manure, the manure or compost application rate should be calculated to satisfy pasture need for either N or P. If the soil test P level is low, the manure or compost rate should be calculated to meet the pasture need for N because such an application will tend to allow for building soil P fertility. But if the soil P level is already in the optimum range, the manure or compost rate should be calculated to meet the pasture need for P maintenance. This application rate may undersupply N, in which case the need for additional N may be applied as N fertilizer. See example on how to calculate manure and compost application rates. A frequent problem with horse pastures is the uneven distribution of manure by the animals. Setting up a rotational grazing system can have many benefits including achieving a more uniform forage utilization and manure distribution. Also, mowing and dragging a paddock at the end of each grazing cycle is recommended to spread deposits. On soils that have already accumulated excess P (Mehlich-3 P>138lbs/acre), there is the potential for environmental degradation, and remedial action to protect the environment may be required. Such steps may include weekly collection of manure droppings from the pasture and composting or exporting horse manure from the farm. Stream banks and water bodies should be surrounded by a vegetative buffer strip. Another remediation approach is to convert the pasture land to hay production. The harvest of hay removes per ton about 10 to 15 lbs/acre of P2O5 and 30 to 50 lbs/acre of K2O, depending on the forage species. Grain crops may also be used but forages remove more P and draws down soil test P levels in less time than grain crops. Nutrient removal values for field and forage crops can be found in Rutgers Cooperative Extension Fact Sheet 014. Application rates for nitrogen (N) are not based on soil testing. The need for N fertilizer on horse pastures depends on the desired plant species, soil type, and pasture yield goal. 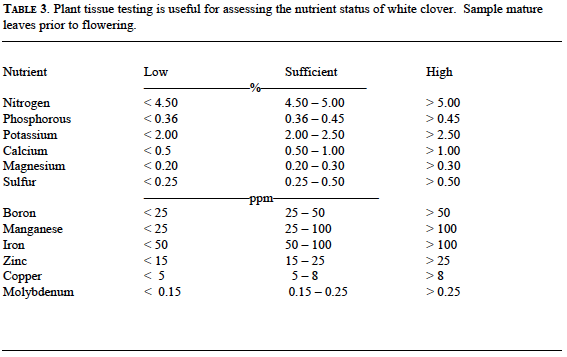 Leguminous crops, such as white clover, do not benefit from N fertilization if they have been inoculated properly with N-fixing bacteria. The species of symbiotic bacteria that fix atmospheric nitrogen in the nodules of white clover roots is Rhizobia trifolii. In addition to being self-sufficient for N, a pasture sward composed of 30 % or more of clover has the capacity to supply the entire N requirement of the grass. If the pasture management goal is to maintain a good mix of clover with grass, it is best to avoid N fertilization. Providing N fertilizer to a mixed sward tends to encourage growth of the grass over clover. When a grass pasture is desired, a regular program of N fertilization is necessary to maintain a vigorous high yield sward of grass. A total of 150-160 lb N/acre/year is recommended, split into 3 or more applications: 40-50 N lb/acre in March at green up, 40-50 N lb/acre in late May or following first full grazing, 40-50 N lb/acre in late August or September. Because N is not stored well in the soil, it is best to apply N more frequently in smaller increments. Ideally, in a rotational grazing system, apply N fertilizer at the end of a grazing cycle. After applying fertilizer, it is imperative that horses be removed from the pasture until a rain has washed fertilizer off of plants and into soil. Soils with a finer texture, such as loam, tend to require less N fertilizer than soils that are sandy. Recommendations for P and K vary depending on the fertility levels as revealed by soil test. In New Jersey, soil fertility levels are based on the Mehlich-3 soil test and are defined for soil test levels: below optimum (low or medium), optimum (high), or above optimum (very high) in Rutgers Cooperative Extension Fact Sheet 719, “Soil Fertility Test Interpretation.” On soils that test below optimum in P or K, soil fertility levels should be improved over a period of years. On soils that test optimum in P and K, maintenance applications K are recommended, but P fertilizer is not recommended in an effort to prevent excessive build up of P. Application of manure P, however, is recommended for soils that have soil test P levels in the optimum range. On soils that test above optimum in P and K, no P and K are recommended for established pastures. Recommended annual application rates of P and K for the different soil fertility test levels are given in Table 1. After a period of three years, retest the soil and adjust the recommendations based on the new soil test report. Maintaining an optimum supply of K is important to the long term survival and productivity of legumes in mixed pastures. Excessive levels of K in soil, however, decrease magnesium (Mg) concentrations in forage, and this may adversely impact the health of grazing animals. Fertilizer P or K may be applied alone in the spring or fall or in combination with N fertilizer. It is recommended that horses be removed from pasture until a rain has washed fertilizer off of the plants. The majority of soils in New Jersey require a regular liming program to neutralize soil acidity and to supply calcium (Ca) and magnesium (Mg). The application of limestone should be based on the results of a recent soil test. Maintenance of a soil pH range of 6.0 to 6.5 for pure grass stands and 6.4 to 6.8 for a legume-grass stand is recommended. A favorable soil pH helps forage plants tolerate stress, and it enables good mineral nutrition of the plant and the grazing animal. A soil pH measurement cannot be used alone to determine the amount of liming material to apply to correct soil acidity. The amount of limestone needed depends on soil texture and other soil properties that are measured by a soil test that determines the soil’s lime requirement. Soil texture and soil pH measurement, however, can provide estimates of limestone required to adjust soil pH (Table 2). The selection of an appropriate liming material depends on the need to replenish soil Ca and Mg which is best guided by the soil test results. For soils that have a high Ca level relative to Mg and need liming, a dolomite limestone is recommended. Conversely, in soils that have a high Mg level relative to Ca and need liming, a calcite limestone is recommended. A properly limed soil should have 10 to 20% Mg saturation and 60 to 70% Ca saturation of the cation exchange capacity (CEC). Rutgers Cooperative Extension Fact Sheets 903 and 905 have additional information on liming materials and liming practice. Sulfur (S) fertilization is generally not based on soil testing. It is usually based on soil type, field history, or plant tissue analysis. Sandy, highly leached, low organic matter content soils are the soils most likely to need S fertilization. Loam and silt loam pasture soils generally have a higher level of organic matter that should supply adequate amounts of S. On soils where sulfur deficiency may be expected, 20 lbs S/acre may be applied using S fertilizers (magnesium sulfate, 14%S; potassium sulfate, 18%S; potassium magnesium sulfate, 23%S; calcium sulfate, 24%S, or gypsum, 19%S) that supply S as sulfate. Consider the soil test K, Mg, and Ca fertility levels to select the most appropriate S fertilizer. Mangnese (Mn) is often deficient in coarse-textured soils of southern New Jersey but is seldom found deficient in fine textured soils of northern New Jersey. As soil pH increases, plant availability of soil Mn decreases. Manganese deficiency is most likely to occur on pastures with sandy soils that have received excessive applications of lime. Clover and grasses exhibiting symptoms of Mn deficiency lack a dark green color. Legumes with a more severe deficiency exhibit green veins with yellowing between the veins of the leaf (intervenial chlorosis). Soil testing and plant tissue analysis (Table 3) are useful for identifying soils that are Mn deficient. Manganese deficiency is often a persistent and reoccurring problem in certain fields. On established pastures with a confirmed history of Mn deficiency, an application of Mn fertilizer (20 lbs Mn/ acre) every spring may be needed to prevent recurring deficiencies, because there is little long term benefit from single application of this nutrient to the soil. Manganese sulfate, which is 32% Mn, is the preferred source. Chelated forms of Mn are not recommended for soil application. Refer to Rutgers Cooperative Extension Fact Sheets 973, 632, and 568 for additional information about Mn nutrition and correcting of Mn deficiency. Sandy coastal plain soils are the most susceptible to boron (B) deficiency. Soils with less than 0.75 ppm B (by hot water extract or by Mehlich-3 soil test) may be B deficient for legume pastures. Legumes in general have higher B requirements than grasses. Boron fertilization is especially important to pastures where there is an interest in maintaining a stand of alfalfa in the pasture mix. Depending on soil test, applications of 1 to 2 lbs B/acre may be recommended for alfalfa. Because excessive B can cause injury to plants, be careful not to exceed the recommended rate. Boron is generally not recommended on grass pastures. Refer to Rutgers Cooperative Extension Fact Sheet 873 for additional information on B.
Nitrogen-fixing bacteria require molybdenum (Mo). New Jersey soils generally contain sufficient Mo, but its availability is strongly influenced by soil pH. Liming acid soils to the proper soil pH (6.5) for pasture production will greatly improve Mo availability. Molybdenum may be applied along with the seed inoculation treatment at the rate of 1 ounce of Mo per 10 lbs of seed, but Mo is generally not necessary for crops grown on well limed soils. For additional information on Mo, refer to Rutgers Cooperative Extension Fact Sheet 972. Deficiencies of iron, zinc, copper and chloride are not common for pastures on New Jersey soils. Refer to Rutgers Cooperative Extension Fact Sheets 971, 721, 720, and 974 for additional information on these micronutrients. A = fraction of organic N that becomes plant available, 0.3 for horse manure with little bedding material and 0.2 for horse manure with wood shaving bedding. Unlike nitrogen, all of the P and K in manure is plant available during the first year after manure application. or 1.22 – 0.81 – 1.35 on a dry weight basis. For additional information about horse manure management, refer to Rutgers Cooperative Extension fact sheet FS036, Horses and Manure. All of the P and K in compost is assumed to be plant available during the first year after compost application. or 2.0- 0.4 – 0.87 on a dry weight basis. Manure that is properly composted results in a relatively dry, solid material that is best used as an amendment to soils rather than as a fertilizer because the compost is high in stabilized organic matter and has a lower N concentration than raw manure. However, the maximum application rate should be based on either the fertilizer equivalent of the compost or the fertilizer requirement of the crop to be grown, whichever is most stringent. Compost that contains incompletely decomposed wood shavings may cause immobilization of soil N and induce a temporary N deficiency in plants. As an example, it is assumed that a grass pasture established in the early fall has a requirement for 60 lbs N/ acre. The horse manure would be applied in late August and incorporated with tillage immediately after being spread. The grass seed would be planted shortly thereafter. We assume that the soil test P and K fertility levels are not in the above-optimum range which would preclude manure application. The field has been limed to adjust the pH to 6.5. Available N – P2O5 – K2O per ton of manure is: 9 – 6 – 10. An application of 6.7 tons of manure would supply 60 – 40 – 67 lbs of N – P2O5 – K2O per acre. 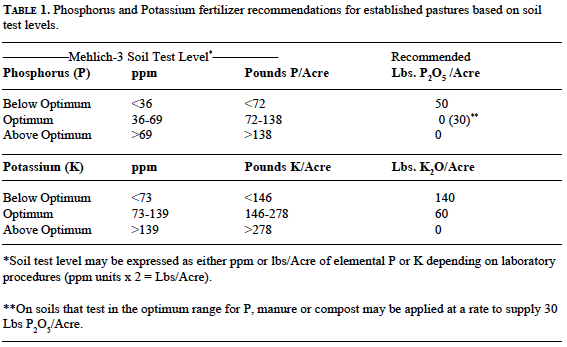 The use of manure would offset the need to apply chemical fertilizer with the possible exception of sites with very low P and K fertility levels. Alternatively, a spring grass pasture seeding could utilize 160 lbs N/acre over the growing season. In this case an application of 17.8 tons of manure would supply 160 – 107 – 178 lbs of N – P2O5 – K2O per acre. These examples assume that tillage or plowing is performed immediately following manure application to prevent significant loss of volatile N.
As an example it is assumed that an established grass pasture has an annual requirement for 150 to 160 lbs N/acre but that only 1/3 of the total N should be applied per pasture rotation cycle. The horse manure would be spread over the surface of the pasture. We assume that the soil test P and K fertility levels are not in the above optimum range which would preclude manure application. The manure should be applied early in the spring as plant growth begins or immediately following a pasture rotation cycle. Because the manure is not incorporated into the soil, only about 20% of the applied N is available for use by the pasture plants. Thus, twice as many tons of manure is needed to supply the recommended amount of N.
An application of 27 tons of manure would supply 49 – 162 – 270 lbs of N – P2O5 – K2O per acre. The use of manure would offset the need to apply any chemical fertilizer. When horse manure is applied annually to pasture, a certain amount of residual N will become available each year from previous applications. The amount of N available in subsequent years from previous manure applications may be estimated using residual availability factors. For horse manure, it is assumed that 8% of the total organic N applied with the manure in the first year will be available in the second year, and 4% of the original total organic N will be available in the third year. For example, if 20 tons of manure containing 0.4% organic N is applied during 2006, an estimated 12.8 lbs N/acre should be credited in year 2007 and 6.4 lbs N/acre in 2008. High quality pastures help protect water quality in streams and lakes by reducing soil erosion and slowing the runoff of nutrients. Pastures that are over stocked and over grazed leave the soil vulnerable to erosion and this contributes to water quality degradation. Nitrogen and phosphorus, whether derived from manure, compost, or chemical fertilizer, are the nutrients of most concern for their potential negative impacts on water quality. To minimize runoff of nutrients from manure, compost, and chemical fertilizers they should not be applied within 50 ft of water bodies on land sloping less than 8% and within 100 ft on steeper land unless incorporated into the soil. Also, soil fertility levels should not be allowed to climb well into the above-optimum range. Manure and compost should not be applied to soils having a land capability classification of V, VI, VII, or VIII as defined by the United States Department of Agriculture – Natural Resource and Conservation Service (USDA-NRCS).